as a true gamer, I am offended. They are saying that you clean instead of doing something else. So for instance you need to do your taxes but you procrastinate by cleaning. well, one of you is probably getting paid actual money for their work while the other is delaying their actual work by doing things around the house. how about letting everyone decide what they deem important for themselves & just enjoying the humor! and if you don't get it, then maybe you shouldn't be delaying your important housework by browsing a site called called tastefully offensive! 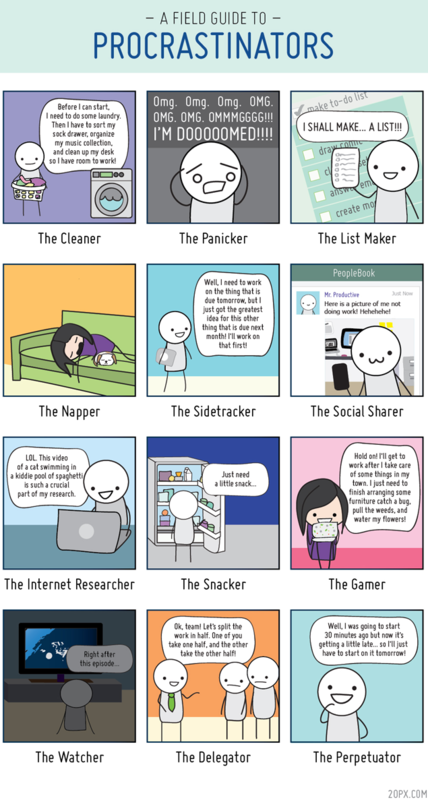 I am a combination of Napper (mostly), Sidetracker, Internet Researcher, Snacker, Gamer, Watcher, Perpetuator, but mostly very, very Panicker. You're not an artist, so you don't share the same values. Pretty easy! And now I am procrastinating by counting the upvotes on this comment. I should go. I really should go. I just searched " cat swims in spaggeti" No results :( I am dissapoint. If you were a true gamer you'd enjoy games of all variety. "If getting housework done is procrastination and drawing an internet comic isn't, then I am confused about what is important and what isn't." This does! I am ALL of these except the Delegator, but only because I don't have anyone to delegate to. Although I have been know to try it, on occasion. Why does everyone have pictures of cats beside their name? Forage for potion ingredients? Just finish this dungeon to level up your paladin? JUST FOUR MORE CRYSTALS TO MINE. I think I have been all of these at one point. Except the delegator, mo dog is pretty useless at helping out. this could also read as "day in the life of a procrastinator"
And it doesn't mean that horror movies don't count as movies because you don't watch them. Which is what True Gamer was suggesting in regard to games; they don't play Farmville, therefore it is not a real game. It's the default icon for people who haven't chosen one. They are playing Animal Crossing. Not Farmville. And the girl in the picture is playing on a DS or a 3DS. I knew it was a thing. It isn't necessary that all kinds of patterns & people shown above are actually procrastinators. Making a list, for example, if it is concise, and makes you keep track of your chores, does not steal a great amount of time. Rather, it can make you more organized, efficient & goal-conscious. Splitting the workload, on some situations, is the only practical way to cope with workloads, especially in offices. Also, one can listen to his own body rhythms, carefully balancing, knowing that if one hasn't started for 30 minutes, nonetheless it is not because of distractions of all kinds, one can learn about his biorhythm and achieve later with greater momentum what needs some rest in order to be carried out most effectively. Until then, one uses the time to regenerate/rejuvenate. Of course, panic is not good for anybody, and should be dealt with in situations of steady commitment & repetitive tasks. A snack is also a common distraction, however, in times of intense study, a health-conscious snack can especially boost serotonin levels in the brain, making for better, smoother concentration and study, switching from one subject to another rapidly. Everything has to be taken according to circumstance, by one's personal expertise of his own lifestyle & accomplishments. Just because you don't doesn't mean others are equally ignorant. Here's a hint: "playing the devil's advocate" is not synonymous with "completely missing the point." In fact, to play the devil's advocate well you have to get the point, demonstrate that you got the point, and still provide a valid counterargument. I AM DEFINATELY THE "CLEANER." Sometimes I'd like to imagine all the things I'd get done if I had minions. OMG! I do pretty much all of them!!! All of them public servants! If by writing this comment, you have refreshed your head, taking a braking from your work or study load, I am glad you now have a refreshed mind full with mental power to continue your tasks. Don't procrastinate! Pretty funny, and I've done almost all of these. If any of you are really struggling with this check out "the Now Habit" it helped me a lot. Haha - so true, oh my! Especially, the List Maker and the Side tracker!